When you are looking for gift baskets that really represent you. 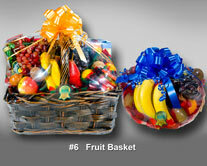 Looking for gift baskets that really represent you and accurately convey your sentiments? When the holidays arrive, our Christmas Gift Baskets are always sure to please.